This is the first set of notes outlines for my Geometry course. Please see the preview file for a detailed outline of this unit. 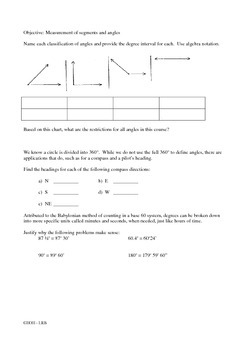 This file contains notes sheets for students to fill in on the following topics: building blocks of geometry, measurement and naming, understanding logic and geometric reasoning and midpoints, bisectors & trisectors. This is part of a series for a whole course of Geometry. Please also see the related Notebook files for instructional use with your Smartboard technology. If you need any additional materials referenced in the Unit Plan, please contact me.